Star Trek VI: The Undiscovered Country is a film I shall remember for my lifetime. It had many great things about it, and was the last we would see the original actors together in a film. 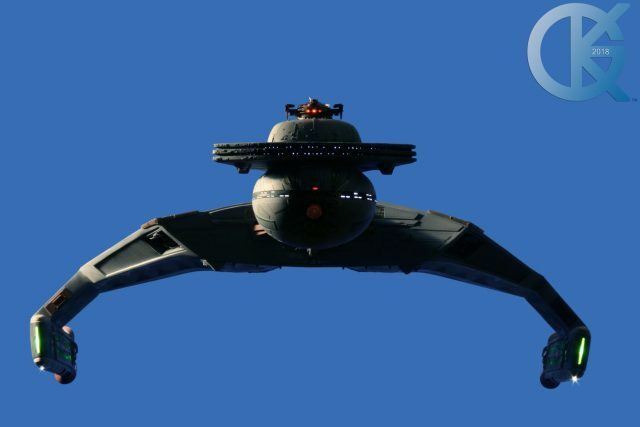 One very memorable scene is after the Enterprise mysteriously fired it’s torpedo’s on the Chancellor’s Flagship K’Ronos One. We are the first to replicate the studio scale filming model, and as such… are able to replicate certain scenes in composite form…. This is the replicated scene where Captain Kirk must face surrender, lest causing a diplomatic incident, and war. I hope you enjoy it! Below is the Blue Screen Photo used to create the above Composite. Click on it to be taken to the full set of Blue Screen Photos of this model.